The 50th anniversary deluxe edition comes in a beautiful metallic printed slipcover case (see below for a few pics of that), and it's bound in "metallic buckram, printed and blocked with a design by Sam Weber." It has 576 pages, with a frontispiece and 11 color illustrations inside, including three double-page spreads and a number of black-and-white chapter-head illustrations. There are "printed map endpapers" by Martin Sanders. It also includes an introduction by Pulitzer Prize-winning critic Michael Dirda, celebrating Frank Herbert's "grand operatic vision." 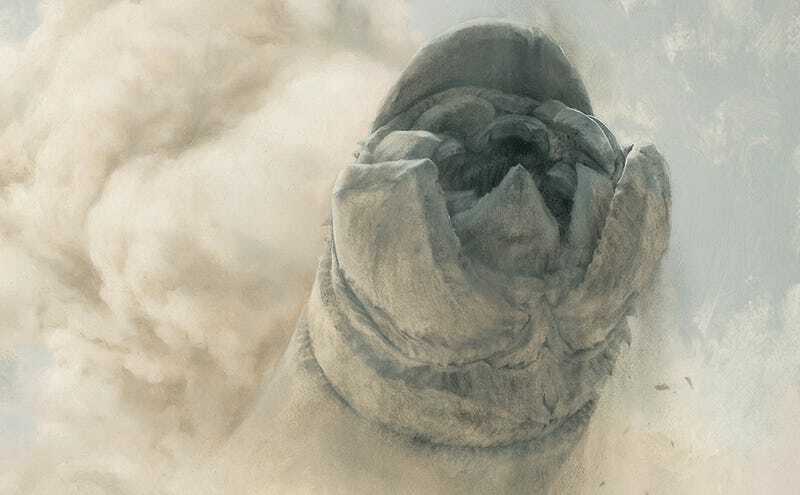 It's a beautifully written examination of Dune, exploring all the reasons why this book has become such a lasting phenomenon. Dirda writes, "this isn't just story, this is history (or at least myth-making)." Plus an afterword by Brian Herbert. But the biggest selling point is all the gorgeous illustrations by Weber. See for yourself below! This new edition comes out April 2. You can't order it online yet, but you can place a pre-order by calling +1 866-255-8280. For more information, check out the Folio Society website.